"This recipe is a hit with everybody! Great for any gathering, especially football parties! Get some while you can! Serve with additional barbeque sauce." Combine brown sugar, salt, paprika, black pepper, cayenne pepper, white sugar, garlic powder, and onion powder in a bowl until evenly mixed. Rub spice mixture over pork. Cover pork with plastic wrap and refrigerate at least 1 hour, preferably overnight. Place the pork into a slow cooker and add enough water to just cover the pork. Cover and cook on High for 4 hours or on Low for 6 to 8 hours. Transfer pork to a large bowl and shred with 2 forks; discard any bone, skin, and excess fat. Drain and reserve cooking liquid from the slow cooker. 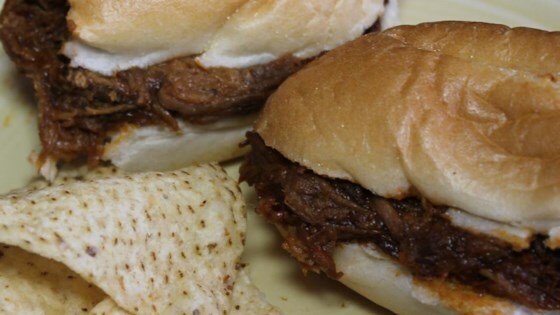 Return shredded pork to the slow cooker and stir in barbeque sauce. Reduce heat to Low and cook for 2 more hours. Add enough reserved cooking liquid to moisten the pork to taste. To cook in the oven, place pork into a 9x13-inch glass baking dish, fat-side up. Add a little water to keep the pork moist. Bake in the oven until very tender, about 5 hours. I did use apple juice instead of water. That was all I had. It is an excellent recipe. Wonderful flavour and very tender. This was a big hit with my family. I cooked it with root beer instead of water and it came out extremely moist. this was so good. my picky kids loved it! I'll definitely pass this along! !